The peace treaty signed in Moscow was dated to the previous day, i.e. 12 March 1940. It came into effect at the front lines at 11am on 13 March 1940. At the time, the forces of the Coastal Group were 15–20 kilometres, the II Corps 20–30 kilometres, the I Corps 30–50 kilometres and the III Corps 60–100 kilometres east of the new Finnish–Soviet border, in the area that was ceded to the Soviet Union. The order to retreat to the new border was issued on 13 March. 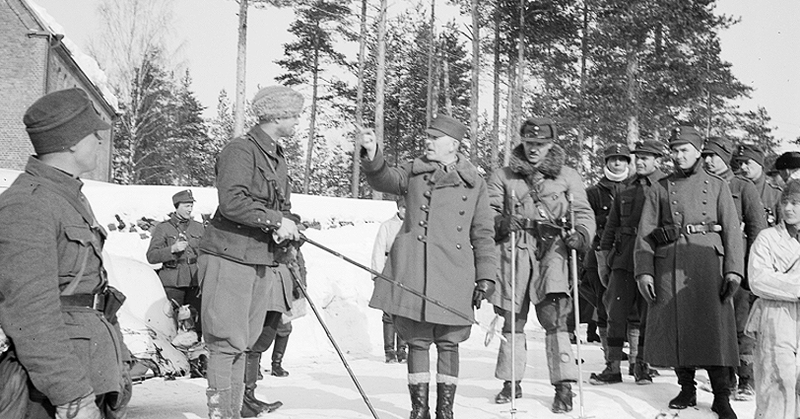 The commander of the Coastal Group, Lieutenant General K. L. Oesch, giving orders to Captain Luukko, the commander of the 2nd Battalion of the 11th Infantry Regiment, in Ylämaa on 16 March. SA-kuva. The 3rd Cavalry Corps (3 CaC), subordinated to the Northwestern Front by the Stavka, was concentrated in the area west of Koivisto (Primorsk) by 11 March. The army corps did not manage to participate in any military operations during the war before the peace treaty came into effect. According to the peace treaty, the troops of the Army of the Isthmus had to withdraw behind the new border between the Gulf of Finland and Enso (Svetogorsk) by 8pm on 19 March and between Enso and Pyhäjärvi (Otradnoye) by 8pm on 25 March. The Army of the Isthmus issued the first order for the troops’ withdrawal at 2pm on 13 March. The map above indicates the general withdrawal lines of the main forces of the Coastal Group, the II Corps (II C), the I Corps (I C) and the III Corps (III C). The rearguard protected the main forces’ retreat, following approximately one day’s march behind them.